Come and enjoy urban YUM! at our state-of-the-art gourmet market on the ground floor of One Park Place. 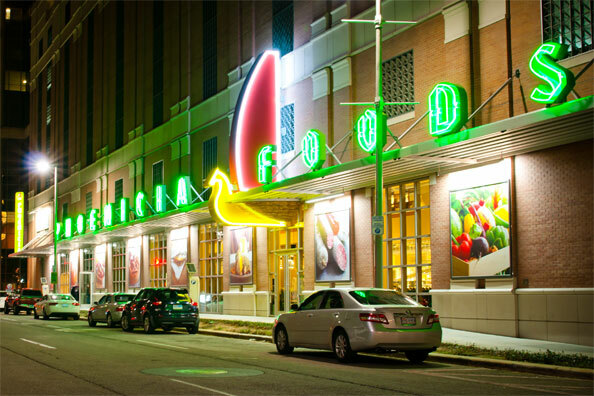 Located at 1001 Austin Street between McKinney and Lamar, Phoenicia Specialty Foods Downtown is an award-winning cultural and foodie experience at the heart of Houston’s Downtown revitalization, surrounded by Discovery Green Park, the George R. Brown Convention Center, Toyota Center and Minute Maid Park. Our Downtown market is a one-stop YUMMY! shop, carrying all of our staple gourmet foods, along with household basics for Downtown residents and employees. Offering quality produce, fresh meats and seafood, artisan breads and rustic-style pizza, boutique wines and craft beers, premium meats and cheeses, a signature coffee and gelato bar, floral and housewares sections, a comfortable dining area and a designated cooking demonstration kitchen, Phoenicia Specialty Foods Downtown is a one-of-a-kind destination for Houstonians and visitors alike. Prepared foods and catering services are available to the businesses and residents of Downtown Houston and its neighboring areas. We are also pleased to offer MKT BAR, a global gastropub offering live music, local art exhibits and family-friendly events. MKT BAR features award-winning American cuisine with an international twist, popular Weekend Brunch, Tuesday/Thursday Steak Night and a thoughtful beverage selection comprised of craft beer including local brews, a worldly wine list, sangria and wine-based cocktails. MKT BAR is also available for special events. Complimentary parking is available at Phoenicia Specialty Foods Downtown and MKT BAR in the One Park Place garage on a first-come, first-served basis. Enter garage on McKinney.